The answer is yes, but there are limitations. Hardwood not only looks great, but the long, clean lines give the illusion of a larger room. Tile may be the standard choice but it is cold on the feet and not as easy to clean, because with hardwood floors you’ll never have to get down on your knees and scrub away grout. Before you think about revamping your bathroom floor with hardwood, there is one important thing to consider: Is your bathroom floor level? If it is and the rest of your house doesn’t already have hardwood floors installed, you’ll have to keep in mind that the bathroom floor will now be slightly higher than the rest of the house flooring as hardwood is thicker than tile and carpet. This, however, can be easily fixed with proper trim. What types of hardwood should you use? 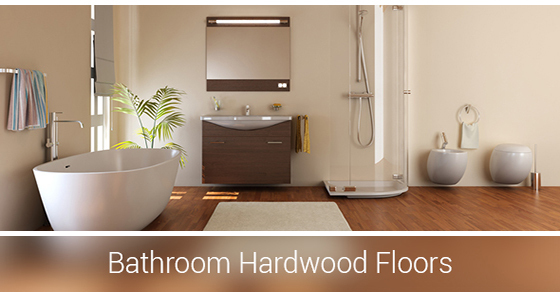 Engineered hardwood is best for your bathroom. Solid hardwood expands and contracts with humidity and, as Mike Holmes points out, engineered hardwood does not, making it warp resistant. How do you treat your hardwood floors? A common misconception is that bathroom hardwood should be preserved like the hardwood we use on our decks. Outdoor decking wood is treated with specific chemicals that make it moisture resistant. These chemicals, although not noxious when used outside as they mix with the air, are highly toxic when used indoors. Even if you keep your bathroom window open at all times, outdoor deck treatments are not suitable inside. There are special treatments for engineered hardwood that you should use instead. Will humidity be a problem in the long-run? The answer depends on you and your willingness to combat it on a regular basis. If you maintain your bathroom’s upkeep, your hardwood floors will retain minimal damage and look absolutely gorgeous for years to come.